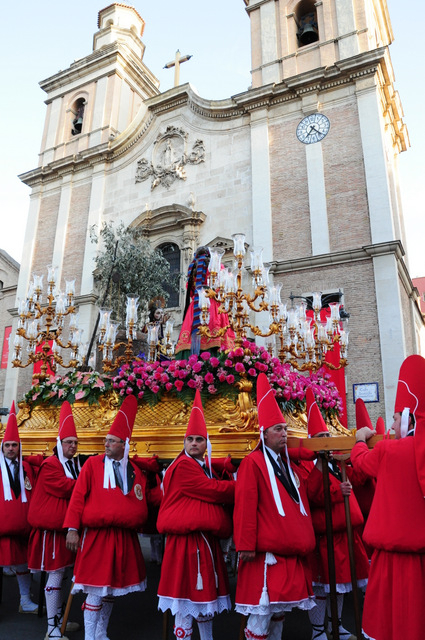 Each town, village and city in the Region of Murcia has its own personality, unique traditions and curiosities which make every event a journey of discovery, Semana Santa or Easter week being one occasion during which these differences can be seen at their most marked. 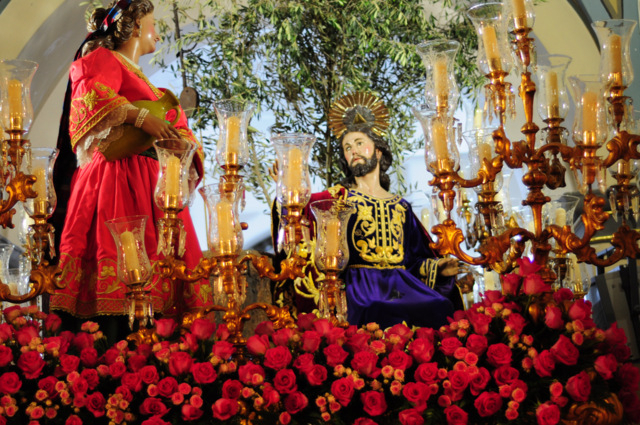 Those who have witnessed Semana Santa in Cartagena will recall the rhythmic clunk as silent rows of mechanical penitents tap their staffs against cobbled streets and smooth cold marble, silken robes shining in rigid gleaming rows, tronos squeezing through the narrow streets of the old quarter bulging with lights, the air heavy with incense and the crush of petals. Lorca Semana Santa goers will recount the breathless excitement of plunging chariots, horses filling the air with dust as they charge up the street, glorious embroidered robes, vast floats filled with papal glory, the fires of hell and crowds screaming their allegiance to the blues or the whites, a sumptuous expression of faith in full technicolour and thread of gold. 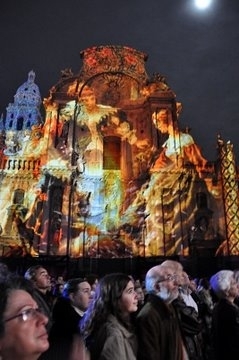 And those who have attended the Wednesday night parade of the Coloraos will nod inadvertantly with an almost parental smile of indulgence, recalling the warmth, the humour, the character and the overwhelming spirit of generosity which characterises Semana Santa celebrations in the capital city of Murcia. 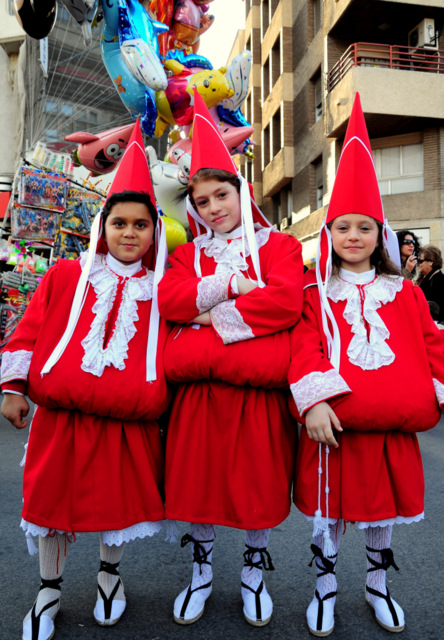 Although Murcians can boast an unrivalled collection of fine Baroque churches, a vast and impressive accumulation of magnificent sculptures by the best masters, and a veritable army of penitents, there’s a surprising honesty and homeliness pervading these parades, which makes the Murcia Semana Santa akin to a family celebration in which spectators are as much a part of the event as those parading in the streets. Indeed, without the warm encouragement and participation of the crowds this would be “just another big city parade” and the procession by the Coloraos, or to give them their formal title of the Real, Muy Ilustre, Venerable y Antiquísima Archicofradía de la Preciosísima Sangre de Nuestro Señor Jesucristo, is one of the best loved and indeed, best attended. 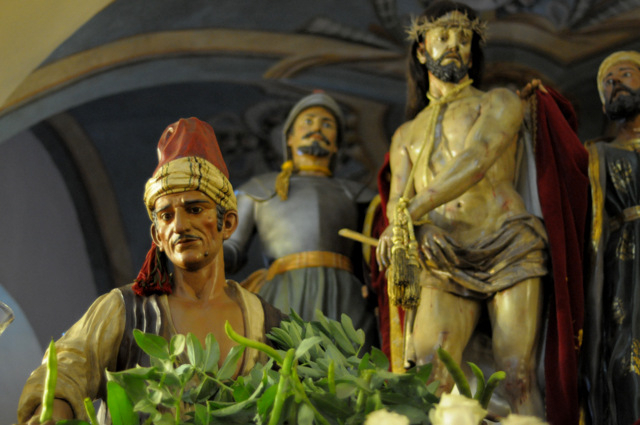 Our own day began in the Iglesia del Carmen, the headquarters of the Cofradía, or brotherhood, watching the florists at work, preparing the sculptures ( pasos) for their evening journey through packed streets. 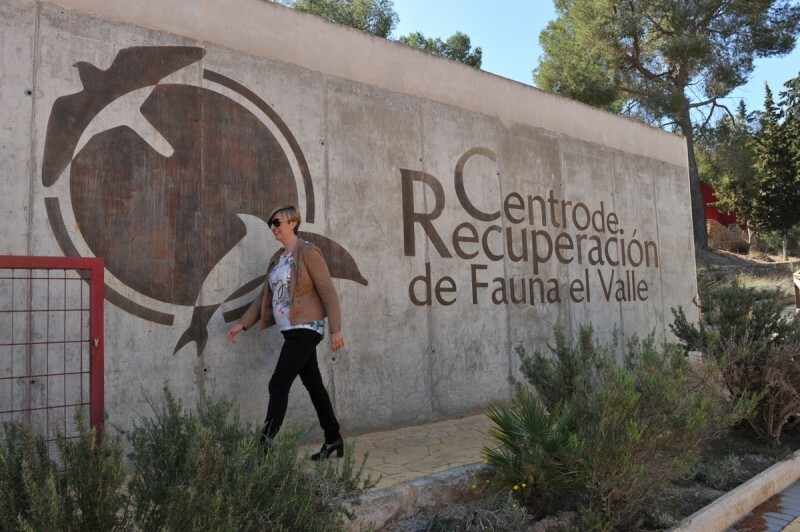 Although some tronos (the structure on which the sculpture is carried, some of them masterpieces in their own right) dripped tears of thinly veined orchids or velvet roses, others were simply dressed with vegetation familiar to every Murcian: broad beans, olive branches and palms from the huertas which surround the city and yielded produce from fertile flat plains, watered from the River Segura flowing through its centre. 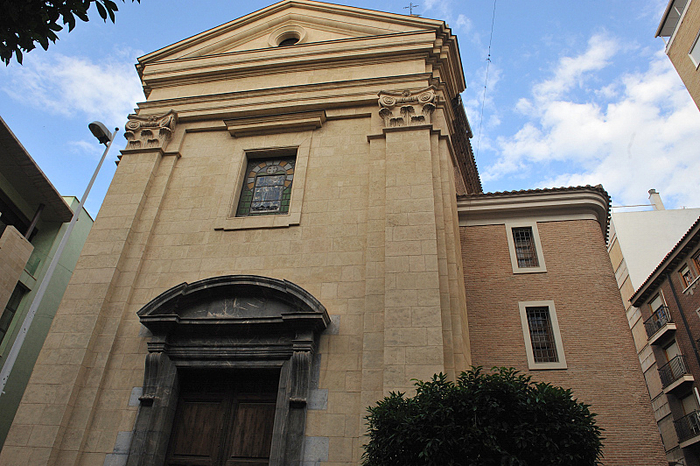 The Barrio del Carmen in which this church is located lies on the south bank of the river and was traditionally the area associated with the rural activities of the huerta, the vegetable basket of Spain and the area in which fresh produce sold to city dwellers on the opposite side of the river was grown. 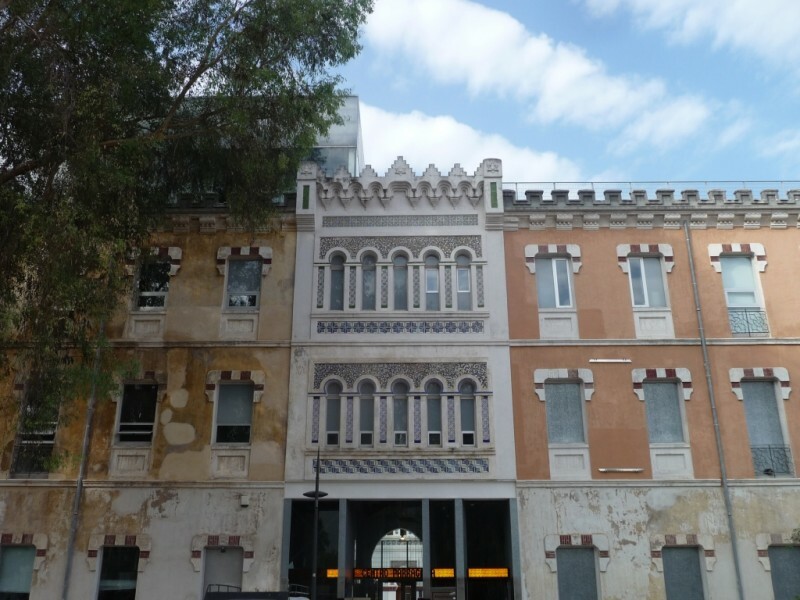 Originally Murcia was a walled Moorish city, set inside high protective walls, the city and the huerta two distinct áreas, and today this district celebrates its agricultural roots with pride, the Coloraos the Cofradía of the huerta. 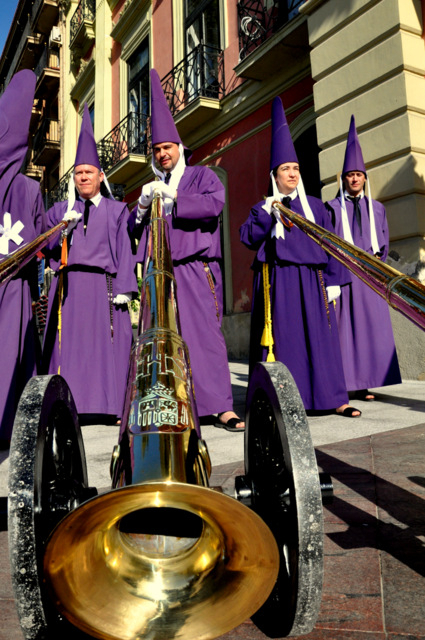 The morning continued in the Glorieta outside the town hall, as the “bidding” took place, vast horns calling the faithful to remind them of the imminent procession and their duty to participate, the harsh braying continuing inside the courtyard of the Palacio Episcopal along with the muffled and rhythmic drumming which is so synonymous with Murcia city. 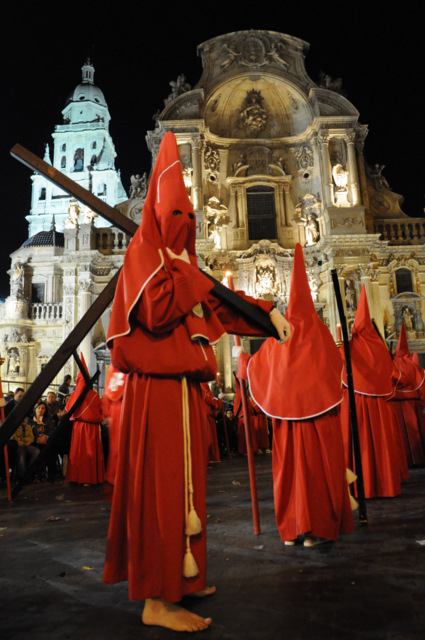 As afternoon turned to early dusk the penitents began to arrive at the Iglesia del Carmen in the Barrio del Carmen, from where the parade begins and then concludes, but anyone fresh from Cartagena expecting the cold faces of smooth satin with their expressionless slits of anonymity was in for a shock, as the grotesquely bulging robes of these participants made them all look a little too overweight for their own good. 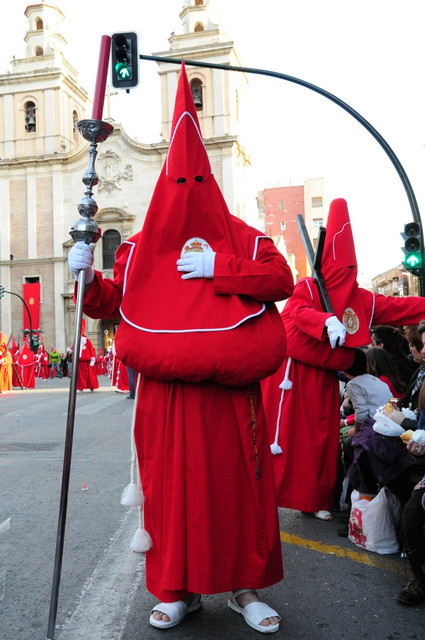 Closer inspection revealed that each carried a huge burden: kilos of sweets, bags packed with small gifts, boiled eggs, Mona de Pascua sweet breads and plump broad beans nestled in a silken cocoon inside their robes, ready to distribute amongst the watching crowds. 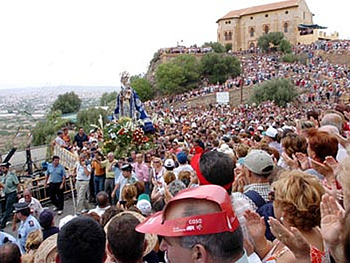 Traditionally the “huertanos” or country folk from the orchards were paid to carry the sculptures by the wealthy who preferred to buy their heavenly indulgences rather than shoulder the burden of the tronos themselves, the habit of popping a few rations for the day on the trono itself banned, leaving the practical huertanos with little option other than to stuff the food inside their tunics. City dwellers watching the parades file past for hours would call for the huertanos to share their rations, and gradually the custom evolved of distributing food carried in the tunics of those bearing the sculptures, until today the penitents carry many kilos of gifts which they distribute to the crowds, children in particular adept at raising an imploring hand to stuff yet more sweets into a sagging carrier bag. Penitents straggle along in a vaguely defined line, chatting to the crowds, pausing to acknowledge an outstretched hand or dodge a wafting balloon, the atmosphere comfortable, homely and relaxed, the crowd cheering and clapping at the passage of each vast trono, shouldered by engorged penitents, with their flapping ribbons and open faces beneath pointed capirotes acknowledging the applause of onlookers. 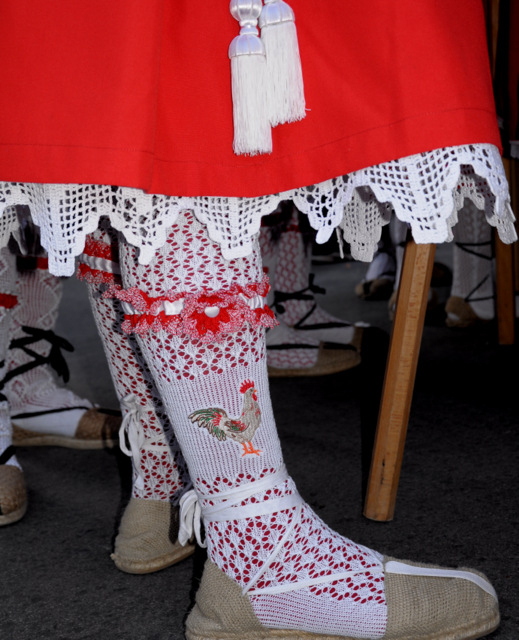 Murcians wear their tunics hoisted up around the waist and tied with a rope, legs dressed with characteristic hand knitted stockings, embroidered with detailed designs to indicate their allegiance to each particular paso, so the portapasos carrying Saint Peters denial of Christ had characterful cockerels embroidered into their stockings, and all wore hand made espadrillas, traditional footwear of the campo, the manufacture of which sustained this region for many years, both Aguilas and Caravaca de la Cruz being important centres of hemp manufacture. 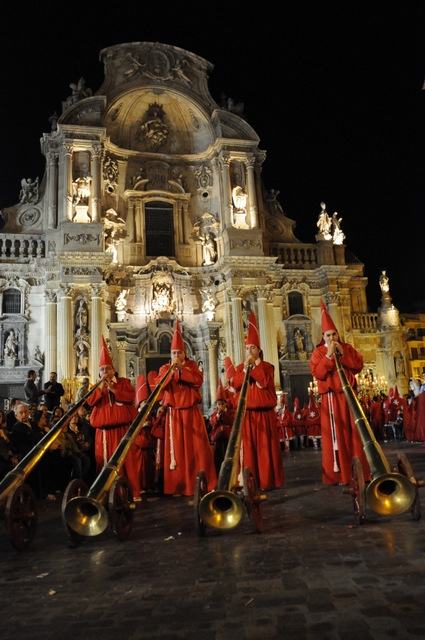 Over 3000 penitents and 1000 children, all wearing the red of the Coloraos stained the streets red with the blood of Christ as they slowly spread out from the Barrio del Carmen, across the river and into the very soul of the city and Plaza Belluga, vibrant red contrasting with the ebullient Baroque sculpture of the Cathedral as they passed, before finally returning to their headquarters in the iglesia del Carmen. 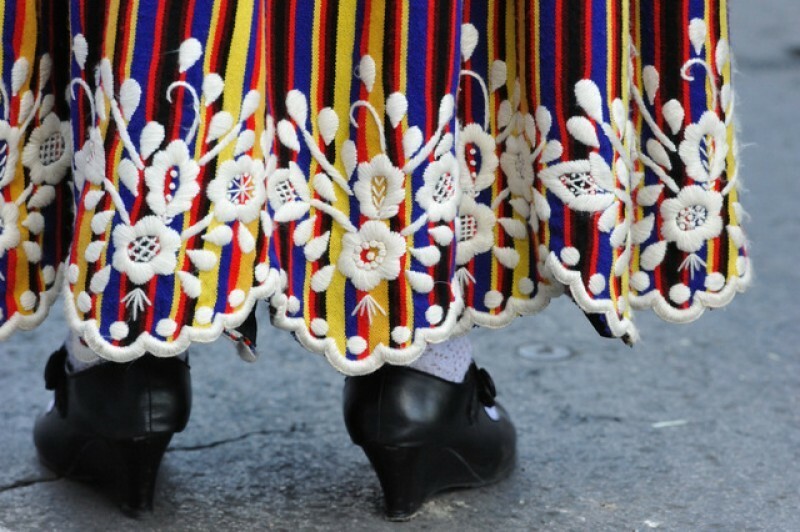 If you’d like to see this parade, relax, as it leaves the Iglesia de Nuestra Senora del Carmen at 7pm and takes about 6 hours to complete its route. Plenty of time for a boiled egg, sweet fresh broad beans and a handful of sweets to top off the meal.